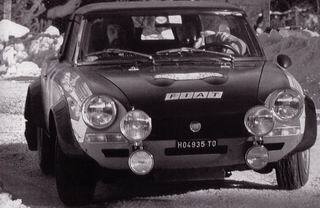 In October 1972 the brand-new Abarth race versions strong from the beginning of 165 HP were operational. They became free for running only at the end of of 1972. It's Rally premiere committed the CSA under Alcide Paganelli and Domenico "Nini" Russo with the TAP Rally Portugal in the prototype class (group 5). A defective gasoline pump threw them on the fifth place back. In relation to the civil remarks at the racers lightly on 950 Kilos they had done infinitely much. "Tuned and improved" was called it so beautifully in the Homologations regulations of the group 4 (500 cars). as legal, as special cranking and cam shafts; Lubrication system, mixture preparation and exhaust organization were subject only to few obligations. The compression rose by means of higher, forged piston on up to 12,5:1, the anyway extraordinarily stable crank gear became more low-friction; they seized to sturdy titanium piston rods. An oil-cooler associated to the water-cooler too, the oil pan was increased and the achievement of the oil pump increased. Those "sharp" cam shafts through still "sharper" replaced, which became suction ports increased, hollow or sodium-cooled valves were anyway already used. All in all engine performances were so finally realized by approximately 165 HP with 7200 U/min - this meant 5.2 kg/HP weight per horsepower instead of 7,2 kg/HP with the series Abarth. The over-powerful 1,8-Liter-alpine-rivals had itself however just on the same maximum speed "high upgraded". Again of Colotti the unsynchronal, extremely durable, but fine-coordinated CCC-5 gearbox (CCC = Cambio Corsa Colotti) came - also the transmission choice was released by the FIA: Had to be free however 100 pieces. The balanced-T section was run-moderately laid out: The first course sat completely at the bottom left hand corner, on one level with the reverse gear. The slip differential came also from Colotti with a lock percentage of 25 up to 100 percent. Still another difference with the series CSA: The screwsteering was laid out, those for front axle was continued to modify with 12:1 instead of 16:1 many more directly. And the Hardtop consisted - in contrast to the civilian CSA - of breath-thin fiber glass. In the inside did not do so much; in the light aluminum dashboard however only the tachometer sat, surrounded by 4 smaller round instruments. In addition on the racing course by Casale a strong 2,0-litre Abarth engine from the racecar Abarth Osella 2000 was mounted for 250 HP by way of trial. Lively realized by the Abarth testdriver, Giorgio Pianta (today Alfa race-chief in the ITC) and of Ingeneur Piero Jacoponi the vehicle in the middle of 1973 one finished and one used successfully with still more unloading tail wing work with the 1973er giro d'Italia. Although there were no further employments, this combination had not by any means coincidentally come off: Already with a press conference at the end of 1972 had announced, project manager Gianfranco Squazzini, not only the new CSA, but also had placed future co-operation with the Osella raceteam in prospect. They hoped to show 1973 in the sport prototype class of the two-litre cars of the competition the exhaust - it left however during this declaration of intent. Starting from January went to that yearly instead of its four work-crews with that to durable Group-4-Abarth into running. The whole year 1973 over remained its colour the same: red basic colour, flat black hoods, black flared wings, summer white roof (otherwise black Hardtop) and white sidestripes. For the first time they were used directly with the 42. Rally Monte Carlo. Also with it were of now on also some the Scandinavian world class pilots such as Bjoern Waldegaard and Rauno Aaltonen, which one had bought as heavily doped Freelancer. With the Monte drove the Fiat teams against hardest competition - against the previous year winners, the Lancia Fulvia 1600 HF, and the Renault Alpine's. But the employment was only one disaster: Bjoern Waldegaard separated early, Paganellis car smashed at a wall, Raffaele Pinto/Pietro Bernacchini became only seventh. Also with the Sweden Rally no headlines were written: Lindberg/Andreasson came only on fifth rank. And in May with the Morocco Rally proved the 124-Abarth-chassisframe as not sufficiently, and Waldegaard/Sager became only sixth. Fortunately 1973 also some laurel could be achieved. High point was, when Achim Warmbold and Jean Todt (the today's Ferrari running leader in the formula 1) came as first from 3 "survivors" Equipes with hard Poland Rally into the goal: 62 teams were failed... Aaltonen/Turvey occupied with the Akropolis Rally the second place, Lindberg/Hertz became fourth. 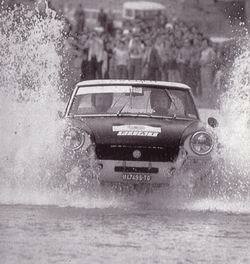 Verrini/Torriani came with the Rally San Remo on second rank, further three Fiat teams followed them on the foot. Achim Warmbold achieved the respected place with the thousand lakes Rally however only. And the coronation was, when Fiat became 1973 vice-mark world champions - this time after alpine-renault & before Fords, Volvo and Saab. Too does not forget the lady European championship, where the earlier Porsche-911-pilots Donatell Tominz/Lucia Mamolo ("Squaw") on Fiats made the run.